Hordes of butterflies dance around blooming flowers to the beat of the buzzing cicadas. A firefly lightshow floods the spaces between trees. An unlucky ant meanders into the jaws of a Venus fly trap. There’s nothing more beautiful, or alive, than the North Carolina Botanical Garden (NCBG) in summer — but not everyone gets to experience its wonders. Katie Stoudemire is changing that. Stoudemire leads the garden’s Wonder Connection program, which brings native North Carolina plants to kids at the UNC Children’s Hospital. She can often be found at the UNC Hospital School, which provides year-round PreK-12 educational services to school-age patients. While some young patients visit the school to conduct science experiments with Wonder Connection, others can’t even leave their rooms for fear of compromising their immune systems. 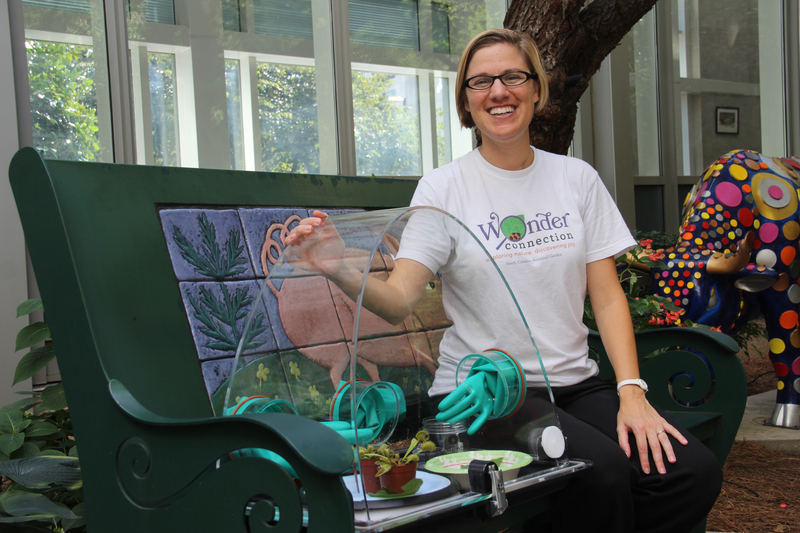 After observing the beds in the neonatal intensive care unit one day, Stoudemire wondered: “What if, instead of putting the kid in the bubble, we could put the plant in a bubble?” From that, she developed the concept for the WonderSphere — a sealed, mobile chamber with built-in gloves that enables hospitalized children to touch nature without danger of infection. After receiving two $25,000 grants — one from the North Carolina GlaxoSmithKline Foundation and another from the Institute of Museum and Library Services — Stoudemire worked with the Bresslergroup to build the WonderSphere. The result was a clear dome that rests on a base surrounded by clasps to keep it sealed. Three portals feature teal, built-in gloves (two for the child and one for a parent or sibling to assist the child). “We set the dome on their hospital tray, and then they’re able to slip their hands in and interact with a variety of objects,” Stoudemire explains. “We give them a magnifying glass, and there’s also a little tray inside that rotates so they can move things around easily.” Kids have the option to observe Venus fly traps and caterpillars, dissect pitcher plants, and make flower arrangements. Stoudemire sits in the UNC Children’s Hospital atrium with the WonderSphere, which she developed the concept for. The next iteration of the WonderSphere is Hippoie Creek — a miniature creek exhibit that sits atop a mobile hospital cart. The reproduction is layered with epoxy to prevent bacteria growth and uses recirculated water filtered to the specifications of the hospital’s epidemiology department. Kids can play with individual rocks within the creek to divert the flow of the water, as well as replicas of aquatic insects to learn about waterbody ecosystems. Katie Stoudemire is the program manager for the North Carolina Botanical Garden’s Wonder Connection program. For those interested in learning more about the program and donations, Stoudemire can be reached by email at sciencekatie@unc.edu or by calling 919-914-0015.